I am very disappointed by my in last trip with United Airlines. My husband is in a wheelchair and we were treated as second class. First you took apart his custom wheelchair and did not put it together correctly. That was our first flight. On our second flight you "forgot" to preboard us, even though we checked in 2 hours early and were waiting for you. Instead you decided to use the isle chair and lift my husband in front of a full air plane. This is the most humiliating thing to someone who can not help the fact that they are medically unable to walk. After you kept saying that he should just walk or stand, if he could he would. Your insensitivity and humiliation of my husband was unacceptable. Then after a long flight we landed at our destination the crew came out to lift my husband out of the seat and into the isle chair then treated him in an inexcusable manner. 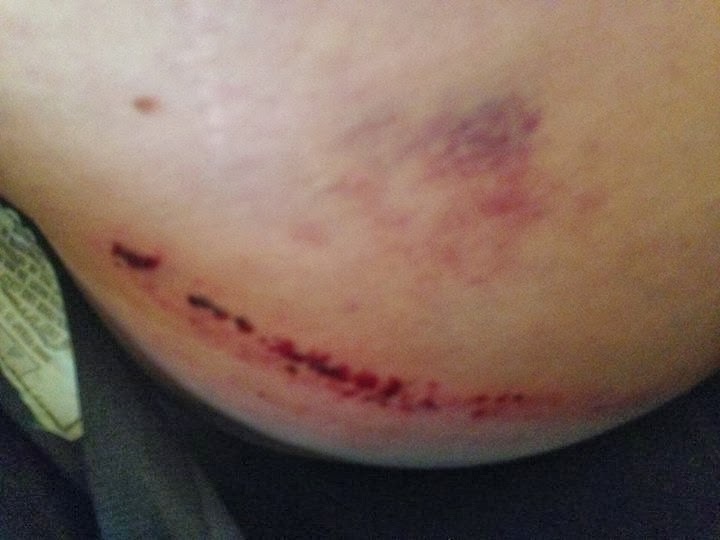 My husband said he was uncomfortable and it was hurting when he was lifted as they scraped his side along the seat. The man lifting him told him that he was ok and that he couldn't feel it anyway. How dare you tell my husband what he can and cant fell. Just because a man is in a wheelchair and can not walk doesn't mean that he has no feeling. He was not fine. You bruised him and cut a huge gash in his side. He was bleeding while you told him to be quiet and that he was fine. This is inexcusable. And to make it worse I have left messages with your comment line and emailed in and I have received nothing. Not even an apology for treating my husband and I so horribly. Is it your normal practice to harm and humiliate a handicapped man and then never address concerns about your airline? We have never been treated so horribly by an airline before. This is a photo of my husband's side the next day. After it had begun to scab. This does not look like something that he seamed to be making up, as your crew insinuated. Maybe now I will get a response when more than just your employees can see my complaint. The answer to the question posed above, "is it your normal practice to harm and humiliate a handicap man", addresses two issues: First, I am sure every commercial airline airline does not want to injure a passenger, disabled or able bodied. An injured passenger is bad business and the industry already has enough problems. Second, there is no doubt in my mind people with a disability are routinely humiliated when they fly. I would contend it is the norm. Simply put, the aviation industry is hostile to disability. This has been a constant for the last four decades. I will acknowledge in the post 9/11 era flying is miserable for all. However, the abuse people with a disability experience is taken to an entirely different level. A number of problems exist. Boarding is a needlessly long process. People with a disability such as myself that use a wheelchair are first on and the very last person last off a plane. The job of assisting people with a disability on has been subcontracted by the airlines to the lowest bidder. The people employed to assist me on and off the plane have no idea what they are doing. The lack of knowledge is often complicated by poor english speaking skills (especially at NYC area airports). Lest my words are perceived to be a critique of the people employed by the airlines to assist me they are not the problem. The real problem is the airlines do not value passengers with disabilities. Because our existence is not valued the airline knowingly allows subcontractors to hire poorly paid employees that are overworked and not adequately trained. Fault does not rest with the those that assist me but rather with a deeply ingrained bias against anything and everything related to disability. Another significant problem that prevents people with a disability from flying or causes at minimum great angst is damage to expensive equipment such as wheelchairs. Most people I know that use power wheelchairs either do not travel at all or use a manual wheelchair when they fly. This severely restricts their ability to function and can cause potential health related problems. Not many people, for good reason, are willing to risk damage to frightfully expensive and hard to repair power wheelchairs. Even annual wheelchair are terribly abused. I have had my wheelchair severely damaged many times. The problems I encounter and typified by the story above are symbolic of stigma associated with disability. Yes, I can get on a plane. Yes, I can fly to any city in the nation. What I cannot do is travel without significant worry. My worries are not garden variety travel concerns but rather worries that could impact my life for months on end. Wheelchairs are not easily fixed. Wounds such as the one above take weeks or months to heal. At no point in my life am I more aware of my disability than when I fly or try to access mass transportation. This is never easy, problems abound physically and socially. Of one thing I am--I will not stop traveling no matter how poorly I am treated. I have rights and I am not about to giver them up. I merely wish the bipedal hordes that surround my might offer a wee bit of support. What a timely post and how central to what I do. Thank you. "At no point in my life am I more aware of my disability than when I fly or try to access mass transportation. This is never easy, problems abound physically and socially." Well said. As I write this I am in "negotiation" with a foreign government about an unreimbursed expense I occurred in their service. They flew me to speak at their international conference on human rights. My topic: The right of people with disabilities. My beef: They left me with a layover of 32 hours in transit and are not paying for the hotel. Yes, "problems abound physically and socially." Inexcusable and the poster and her husband should sue, if at all possible. I think the entire airline industry has degenerated to a point where it has become a health risk to fly that is bordering on unacceptability. When that happens, those that have any condition that is outside the "healthy" range are going to have particularly adverse issues. Since motorized wheelchairs and other such equipment cannot be accommodated, some service to have one at each destination for use should be required. Any breakages and damages to equipment be severely fined. I wish there were attorneys focusing on these issues. The fist on, last off model, however, appears to be important as the poster here indicates being Last on is truly humiilating and being first off can be risky with all of the passengers gung ho to leave.